RESISTOR_ is a fast and intense two-player competitive card game that relies on hidden information and tactical decision-making. 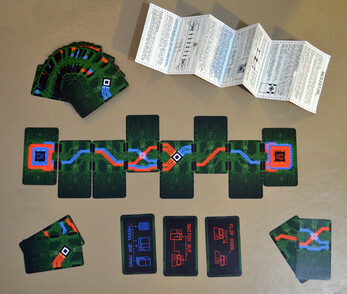 Through the manipulation of double-sided cards on the table and in your hand, you create a connected line of your color that goes across the board into your enemy's base to score a point, increasing their DEFCON level. Score four times to push the enemy past DEFCON 4 to successfully launch your nukes without a counterstrike. The instructions are in a separate PDF file you can download. Thanks!